Also a picture attached showing the whole thing which is mostly breadboards atm but theres a couple of finished perfs. I've sern how tidy your modules and perfboards look Phobos, so I knew my mess of wires would shock you a bit! OMG, can't believe that you got that to work. Better draw a schematic, quick, before you loose control. It sure sounds great. Thanks guys - you lot have helped me out loads. I've got it mostly drawn up by hand but to put it on KiCad will take ages. well i just thought i would pop by to see how the site is going, and saw this. I drew a schematic, moved it to perf and then it didn't really work and couldn't check on the breadboard what I did different. With a project this size that could get really difficult to figure out. Great tip. Will keep that in mind before I do anything rash! Nice sounds. Looking forward to more of this ... so many wires! I had to save that picture to use as my desktop background screen for inspiration. You MUST love the workbench of the late Jim Williams from Analog Devices. I think it is actually preserved in a museum. 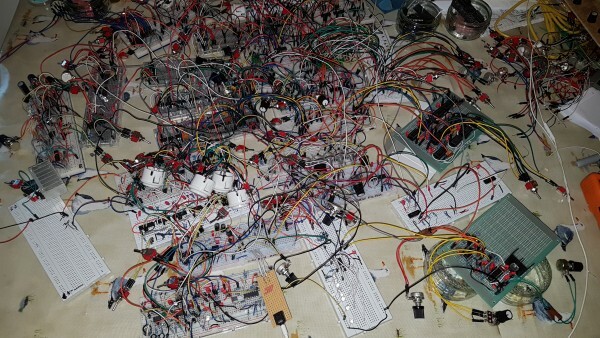 Heyyyyyy ... you've got more breadboards than I do! Aiming to condense it down onto 10 small perfboards (46 x 30). The first photograph is classic! Many years ago in the days of the first 8 bit home computers, a hobbyist had made a similar hookup to create a working 8 bit DIY computer. A magazine or newsletter published his photograph of it. His assembly was on a table until his cat jumped on it after which it was more of a water fall (wire fall?) half onto the floor. However, it still worked after that.